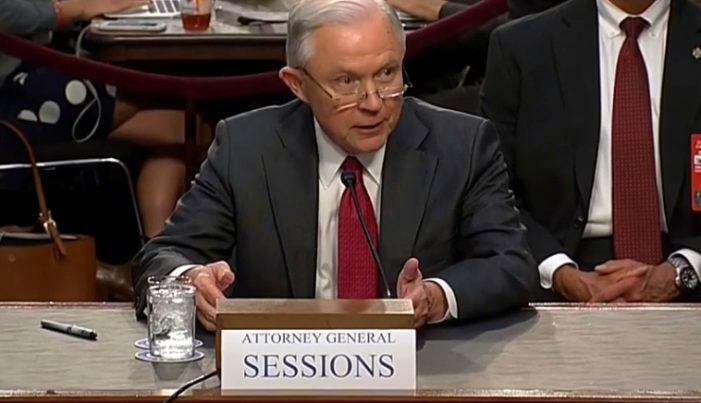 Right off the bat I want say that I think, personally, Attorney General Jeff Sessions is a decent and honorable man who is nothing like the person he has been made out to be by malcontents, miscreants, psychopaths, and fools in the Democratic Party and the Left. But niceties aside, we have a republic to save. I no longer believe that he’s capable of serving in his current capacity as the second-highest ranking law enforcement official in the country behind the president. I’ll explain. Long before Donald J. Trump won the November election and was sworn in as our 45th president, evidence existed that Hillary Clinton, former FBI Director James Comey, former Attorney General Loretta Lynch, and former National Security Advisor Susan Rice were complicit in crimes against the state as well as crimes against the American people. As noted by Gregg Jarrett, a Fox News legal analyst and former defense attorney, Sessions has taken no actions whatsoever to right the wrongs that are now so plainly evident, just based on open source reporting, as to make him seem unworthy, incompetent, or incapable of carrying out his duties as head of the Department of Justice. And frankly, if the American people cannot trust the Department of Justice, there is nothing left to defend in this republic, for the rule of law will have completely broken down. — He has yet to appoint a special counsel to reopen the investigation into Clinton’s improper use of a personal, unsecured email server over which reams of classified information passed — all likely violations of the Espionage Act. — He has ignored Clinton’s obstruction of justice over her deleting 33,000 emails that were under congressional subpoena — emails that likely would show she was engaged in “pay-for-play” using her role as secretary of state to extract millions in donations from foreign donors who assumed they’d be dealing with her in the Oval Office instead of Trump. — Sessions has to date taken no action against Rice for her improper unmasking of American citizens tied to the Trump campaign and who were under surveillance by the Obama administration. Then, of course, there is the possibility that Comey has also violated not just Justice Department and FBI rules, but also may have perjured himself before Congress, which is also a crime. He also appears to have stolen government documents and then leaked them to the media (all with the intent of having his friend and former FBI director, Robert Mueller, appointed to investigate Team Trump).